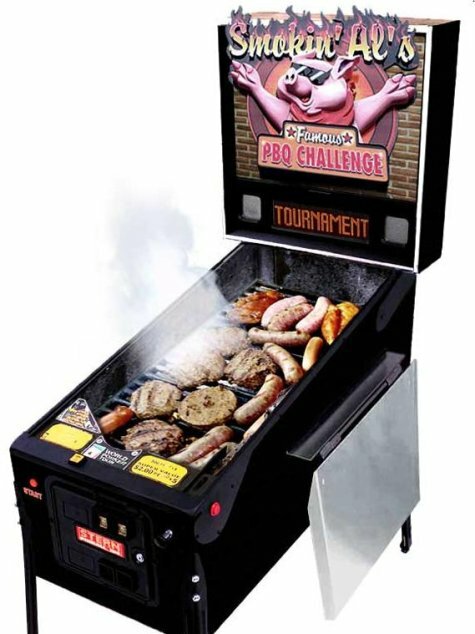 I’m a huge BBQ fanatic and also a pinball fanboy. I had a friend in high school whose dad collected pinball machines, and I used to hang out at his house and play free pinball all the time, and also would lend a hand in repairing the machines. While I’m on the topic of pinball, I would like to put forward my theory that the Tony Hawk Pro Skater games are a modern extension of pinball. The games aren’t about skateboarding as much as they’re about racking up a high base score and getting a huge multiplier. Plus, you’re moving this rolling thing all around a physical environment consisting of ramps and things to bounce of off. On top of that, pulling off a single chained mega-trick in THPS is a very similar experience to keeping a single ball in play in any pinball game. I did not expect to like the THPS games, but I bought THPS 3 based on the perfect 10 score that it had received in Gamespot. And they were right: it was a brilliant game and I loved it, although I had to figure out why since I really had no interest in skateboarding. When I made the pinball connection, it all became clear to me. The aesthetics of THPS may be skateboarding, but the mechanics and especially the dynamics are mostly pinball. As for the Tony Hawk games, they have multiple assets which make them great games to pick up and play, not the least of which is music exposure. Tony Hawk 2′s soundtrack was a sublime mix of well known (Bad Religion, Naughty By Nature) and lesser known (Millencolin, Swingin’ Utters!) acts, which set the mood of the game well and exposed the millions of players to the kind of music they should be hearing. Plus the gameplay itself appealed to collectors (find all the secrets), perfectionists (max score tricks and combos), and action junkies (just play for thrills) alike. Before I found a copy of Soul Calibur II in Gamestop, I had THUG2 for Gamecube loaded in my Wii. It’s not bad, but because the format shifted from these short arcade levels to sandboxes where you have to discover and complete obscure missions, it’s really focusing more on the perfectionist player who wants to play the game to learn and master everything about it, rather than me (the action junkie). It’s rather less like pinball, and more like Labyrinth, as steel ball games go.